The January thaw has begun. More brown grasses and weeds are showing through the snow, water is moving – or moving water is no longer covered by a sheet of ice. And one begins to think that spring may actually arrive – of course we still have February and most of March to go! This painting really focuses on dark water and the light, snow-covered landscape. It is one of those qualities that make winter the visually interesting season that it is. 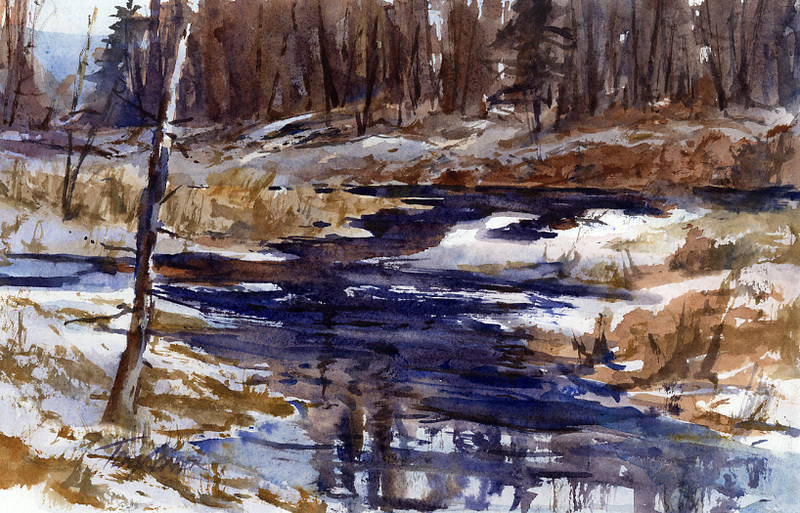 It is that quality that appears in at least two other of my winter series paintngs – “One For Winter” and “Fallen Tree Over Frozen Stream“. In this morning scene, low winter sunlight had not quite reached the low lying marsh area off of Cider Mill Road. The snowy parts of the landscape lye in a light, but low-key gray. Even so, the dark water created a stark contrast to the light areas of snow.